Bill Smith will forgive me for saying that they are more well known for their tremendous Pinots, but when we tasted this at their Calistoga base it was obviously a class wine. its rare to find such a decent Cabernet for a relatively low price. Bill and Joan describe this as a 'drink now' cabernet but the balance suggests it should last in the cellar. 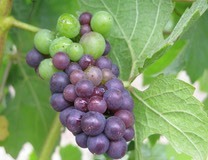 The Howell Mountain fruit is very distinctive and comes across well int the cabernet. Chocolate undertones for a ripe berry style Cab. The dominant fruit is blueberries and all wrapped up in a slightly mineral taste. Wonderful.